Butler, Party of 4: An Eye-opening Weekend! This past weekend one of my best friends from high school, Emily (who is also one of my beautiful bridesmaids) came up to visit me from Valdosta. We stayed up super late Friday night (as usual) talking, and it was SO great to catch up with her. She’s the kind of person who really tells it like it is & shares exactly what she thinks, which I love about her. I would definitely go to her if I needed an honest opinion about something! She stayed the whole weekend & although we both had other plans while she was here, I REALLY enjoyed our time spent together. Sunday after church she had an opportunity to try on her bridesmaid dress and it looked fabulous on her, just as I knew it would! I am in LOVE with my bridesmaid dresses!! She is actually the one who got me into this whole “blogging” thing. You should check out what she’s got goin’ on… She’s a brilliant blogger & so open and honest- it’s hysterical and always very interesting!! I truly believe that most women, no matter how confident or “have-it-all-together” they may appear, struggle with insecurities in some area of their lives. Although I think I’ve become more grounded and confident since college, I naturally still struggle sometimes. I’m a fervent note-taker, so I’m going to type up the notes I took while I was there. Hopefully you’ll find them as helpful and applicable as I did. I truly believe if I can put this into action in my own life I’ll see a lot of benefits in my relationships, self-esteem, and stress levels. Here ya go lovely reader! -You have NOTHING to gain from your insecurity. -Insecurity & humility are NOT the same thing. -Insecurity is not a weakness, it’s unbelief. It’s unbelief that Lord is who He says He is and you are who He says you are- A wonderfully made child of the Lord. S: Saved from herself!! We’re our own worst enemy & critic. Our insecurity is a twisted form of self-interest and pride. Secure people don’t have to self-obsess. Insecurity goes hand in hand with narcissism. With insecurity everything curves back in on us; we make everything about us when in reality it probably has nothing to do with us. After we’re infiltrated with the Holy Spirit and become secure, “stuff” no longer curves back in. It goes directly up to God and out to others through love. C: Clothed with intention!! Proverbs 31:25 “clothed in strength and dignity” JESUS is our security if we’ll let Him be. Security begins in the mind. U: Upended by grace!! How much of our unforgiveness has to do with our own insecurity? The reason we cannot forgive is because we do not truly feel forgiven for our own sins and wrongdoings. Whatever measure of forgiveness we feel from Christ is what we’re willing to grace others with. We are made NEW creatures in Christ, but we are still convinced we’re our old selves. Grace is the only thing you can give away and still have enough to keep for ourselves. Unforgiveness is like a giant tapeworm that will eat you alive, so if you want to be a secure woman you have to forgive. R: Rebounded by love!! Ephesians 5:1 Live like the dearly loved child you are. Be an imitator of God. If a heart does not heal, it hardens. We try to place our security in other people, but they will always let us down. God is the only one who loves us with a measureless love. E: Exceptional in life!! EVERYONE has a need to feel significant. React to every situation with your “new” self. If you are secure, you WILL stick out. For me, I’ve found that I try to compensate for insecurity through keeping myself as busy as possible, being involved in everything, and making sure it looks like I have it all together. And trust me, I don’t. I’m a people pleaser. I go through phases with my confidence/self-esteem, and my goal is to become more consistent. Our fabulous preacher’s wife/director of Women’s ministry/brilliant Bible study teacher always says that “The biggest threat to the enemy is a consistent believer.” I’m working on my consistency in all areas of life. The two points that resonated most with me are 1) Insecurity is a form of unbelief/pride/self-interest. 2) Secure women are exceptional in life. It's okay to be a work in progress. Here’s to the journey of becoming a truly SECURE woman in the Lord. we seriously just posted about the weekend at almost the exact same time haha blog twins!!! :) I LOVED our time together and so badly wish we could live closer! I think Jonathan will like my shout out on my blog to him :) I plan to post my notes too and it's so funny we both got different things from it but the same overall picture. You ARE an exceptional woman! Don't forget that EVER! I love you very much and glad you can handle my honesty especially Sat night as I was so out of it I have NO CLUE what I was talking about! haha! 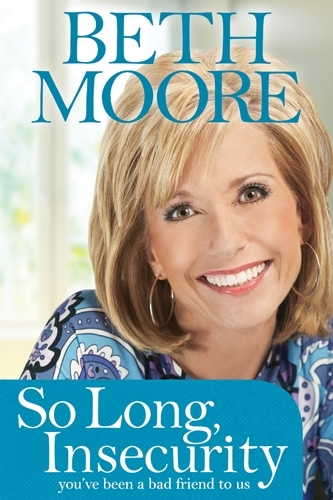 I loved the Beth Moore notes! Glad you finally got to catch up with Emily,she looks so good in the dress. She cracks me up about how cute Jonathan is..you know I got her back on that one!!!!!! A work in progress...I am marinating on this today.